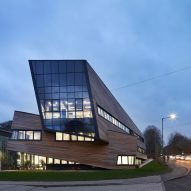 Daniel Libeskind has revealed his latest project – an £11.5-million centre for cosmology and astronomy researchers at Durham University in England. 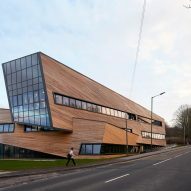 New York-based Studio Libeskind designed the Ogden Centre for Fundamental Physics to host office and events space for the university's Institute for Computational Cosmology, the Centre for Extragalactic Astronomy and the Centre for Advanced Instrumentation. 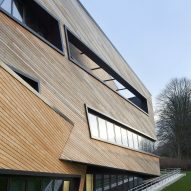 The larch-clad building is conceived as a series of stacked and intersecting blocks, with a skylit atrium at its centre. 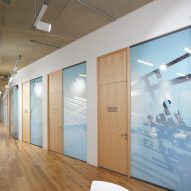 Huge windows located in the ends of the blocks and strip glazing in the flanks ensure the 80 offices distributed around the perimeter of each floor receive adequate natural lighting. 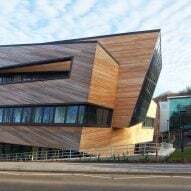 Wedge-shaped balconies set behind the timber cladding and a terrace on the roof ensure researchers, support staff and visiting specialists can take in views towards Durham city and its cathedral during meetings and breaks. 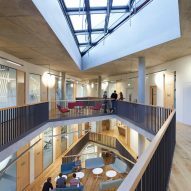 "A spiral in plan, the centre is designed as continuous, stacked and interlocking forms," said the studio. 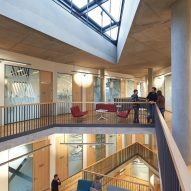 "The active form of the building unifies a rigorous, repetitive programme of private work spaces along its perimeter with a communal multistorey interior space activated by gathering spaces and a massive central skylight." 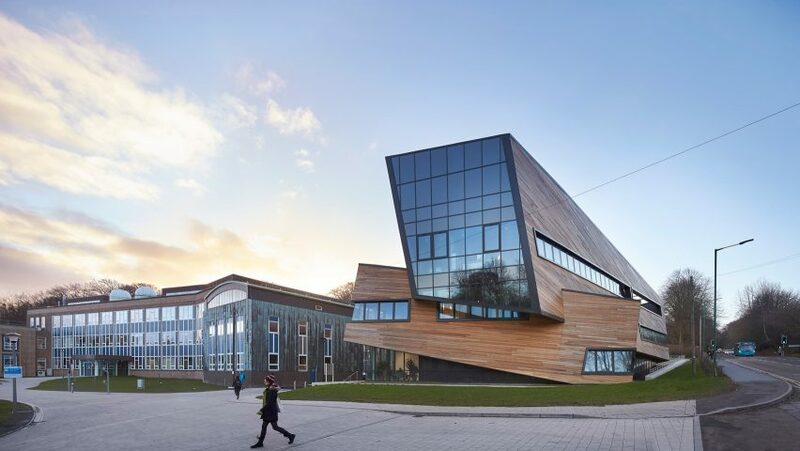 Plans for the 2,500-square-metre facility, which is set beside the school's Department of Physics, were first unveiled by Libeskind's office in early 2014. 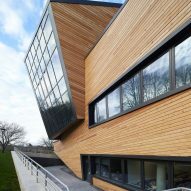 Special attention has been given to sustainability throughout, from the selection of Scottish larch as cladding to LED fixtures and renewable energy sources such as the ground source heat pump and solar panels. 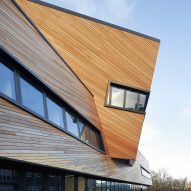 "This project is an example of how to design a highly sustainable, dynamic building within tight programme requirements," said Libeskind. 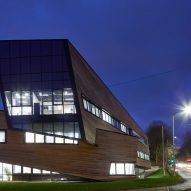 "Light and openness is at the core of the design; at every move in the design process we incorporated simple yet robust materials and considered the users' experience to create this important building for Durham University," he continued. 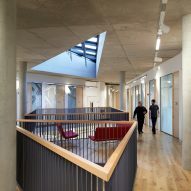 Inside, exposed concrete columns and ceilings are coupled with warm-toned woodwork and frosted glazing that helps natural light filter from the peripheral windows to the centre of the plan. 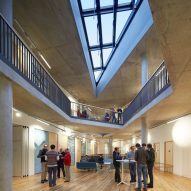 Skylights provide additional lighting for the central atrium and meeting areas. 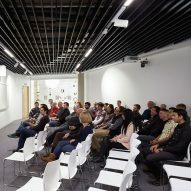 A 100-seat seminar room is located at ground level, with socialising and events space for staff and students on the floor above alongside breakout rooms for videoconferencing. 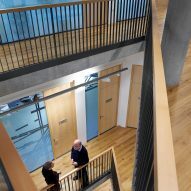 The third floor houses additional office space and provides access to the roof terrace. 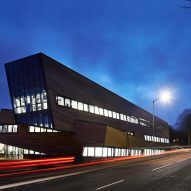 "The new Ogden Centre for Fundamental Physics represents a wonderful contribution to the unique architectural heritage of Durham City," said Carlos Frenk, the director of the Institute for Computational Cosmology. 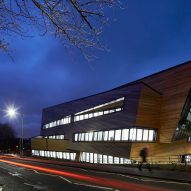 "Its design reflects the requirements of a top-class research centre, dedicated to seeking answers to some of the most fundamental questions about our universe such as: How and when did our universe begin? What is it made of? 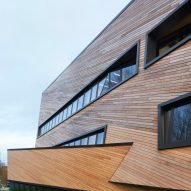 How did galaxies and other structures form? 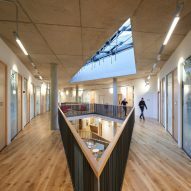 The new building is an amazing place in which to work," he added. 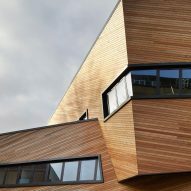 Polish-American architect Daniel Libeskind – number 46 on Dezeen Hot List – is particularly known for his memorial architecture, including the Jewish Museum in Berlin and recent commissions for holocaust museums in Ohio and Ottawa, and a museum of Kurdish culture in Iraq. 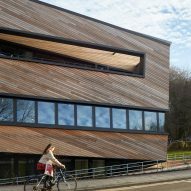 His studio is also currently working on a 105-metre pyramidal skyscraper in Jerusalem and a museum for Lithuanian art in Vilnius.